Following the brushed stainless line here are first prototypes of combo of bottom instrument panel with integrated radio pocket. The panel is direct bolt on to the MK1 center stack, the radio (CD/DVD/MP3) itself attaches P&P to panel and integrates with the stainless frame at the front. Love the custom one you made for me! 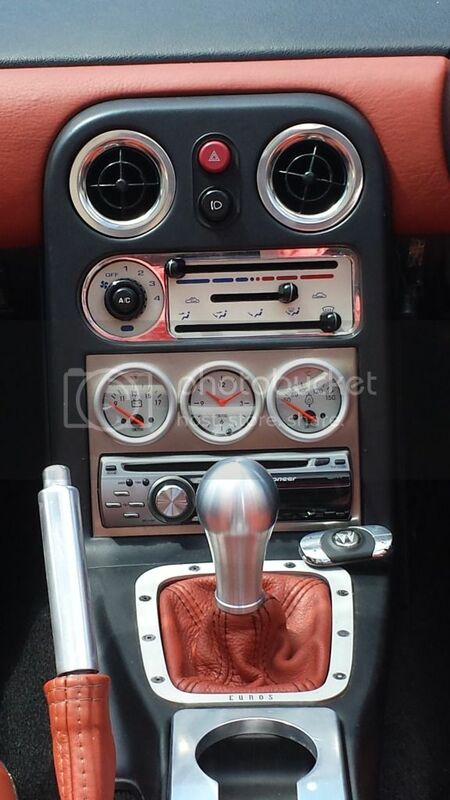 The sport style gear knob goes nicely with it too! Great picture - integrated and matching interior! Thanks for the feedback, Lance! awesome panel! Could you make 1 with a cutout for an iphone 4? and what would that cost ? Radio on the bottom and a cutout for an iphone above that? like this? It should be possible to integrate the cutout for the iphone only, but what would be your idea to fix it there (similar to the pic)? wel i was thinking to make something out of plexiglas and then spraypaint it. and glue it to the back of the panel. Actually I am now sorry for the late reply! Sure this is possible, best would be to simply measure the phone size and connector space (still having the same model iphone? ) and let me know. We will prepare it cut to size and you will finish the rear. well i guess i have to wait then cuze i'm getting a new phone in january .